This new retro turntable from Pyle was designed with the sleek chrome styling of 1950s-era jukeboxes - but it's been updated with technology from the 21st century. 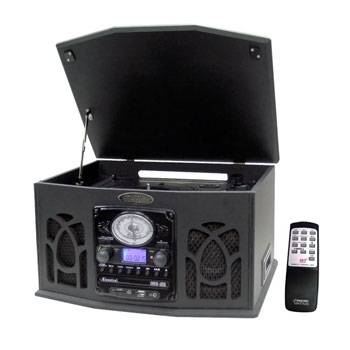 The two-speed turntable has a built-in speaker and plays records, cassettes, CDs, and MP3 files via the USB port or SD card slot, and the radio covers both AM and FM bands. You can also encode your vinyl to MP3 files directly to a USB/SD card - so you can listen to your favorite hits on your digital music player. RCA line out allows you to hook up this turntable to your home theater system for rich, full-bodied audio. You can also listen privately using the 3.5mm headphone jack. Includes a wireless remote control.